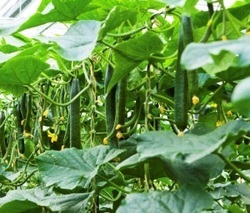 While many plants can be grown in hydroponic systems, there are some that do far better than others. The most successful among these species are tomatoes, lettuce and peppers. Each prefer warmer “greenhouse” type conditions with only lettuce having slightly different nutritional needs. If you’d like to learn which are the best hydroponic nutrients for these popular fruit and veggies keep reading. If you’re a beginner in growing hydroponic lettuce or have yet to try, choose an easy to grow type such as bibb, black-seeded Simpson, Boston or Buttercruch lettuce. Have temperatures set to about 23.8C in the daytime and about 12.7C at night and be sure to fluorescent, LED, metal halide or high pressure sodium grow lights to support plant growth. Since peppers love warmer environments they make a great choice for hydroponic systems just be ready to stake them to support their growth. Your choices range from cayenne, Fellini, jalapeno, Narobi, gold flame and cubico peppers. When developing your pepper seedlings maintain temperatures between 20C – 22C then increase them gradually to around 21C – 26C as your plants grow. At night it’s best to reduce temperatures to 16C – 18C. Tip: When your plants grow to a mature height it’s time to keep evening temperatures a bit higher and decrease daytime temperatures to encourage fruit production. Similar to peppers, tomatoes thrive in warmer conditions and usually do quite well in hydroponic systems. However, when just starting out, you need to grow your hydroponic tomatoes from transplants rather then from seed. This provides you with better control over the conditions necessary for optimal growth. Disease resistant varieties are best to start with, like sweet 100s or Cheritas if you like cocktail or cherry varieties, another good variety are Daniela tomatoes. Have your nutrient system flow for a scheduled 4 to 6 times a day. Keep your tomatoes in a vertical position and stick to the same temperature adjustments that are required for growing peppers (daytime temps being 21C to 26C and evening temps kept around 16C to 18C). It’s no surprise that the same supplements can be used for tomatoes that can be used for peppers since they both require the same growing conditions. When getting nutrients for your tomatoes look for these in the following amounts (measured by grams per 1000 litres). An optimal growing environment combined with the best hydroponic nutrients allow plants to flourish and produce their blooms, fruit and veggies more abundantly.